Kids derby is Sunday beginning at 6 a.m. on the Oak Bluffs Steamship wharf. The Striped Bass and Bluefish Derby began last Sunday at 12:01 a.m. and for a week now the beaches and boats have been filled with anglers of experience. But, you may ask, how did they all get hooked on the spirit and tradition of fishing? Many ways of course, but a big one is the annual Kids Derby Day, an integral part of the derby where kids ages four to 14 get to fish from the Oak Bluffs Steamship pier for one day only. The event is Sunday, Sept. 16 from 6 to 8 a.m. — fishing usually involves not sleeping. There is no registration needed and the event is free. Just walk up to the pier and head out to fish. It’s a prime spot, all those pilings that fish like hang around, like co-workers at the water cooler. Best of all for wee anglers there is no need for casting skills; just drop a line into the water and wait for the nibbles to begin. Fish are judged by length not weight and there are prizes galore. So set the alarm on Sunday morning and get the next generation involved. 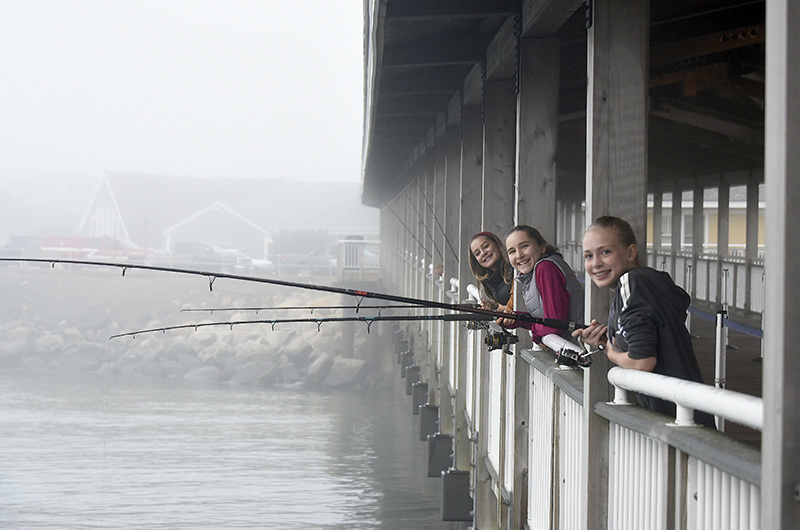 And after the Kids Derby head over to Edgartown for the morning weigh-in, running from 8 to 10 a.m. After that, well there’s still nearly a month of derby fishing for the family now that your children have taken the bait.